It's another salvo in the ongoing fast-food breakfast war: McDonald's announced Friday that it will offer customers nationwide a free cup of McCafe coffee for two weeks. The nation's largest fast-food chain said the campaign, which kicks off on Monday, will give breakfast customers at its participating locations a free 12-ounce small coffee. And it will be up to each McDonald's location to decide if customers get just one cup or refills on the free coffee. McDonald's (MCD) coffee gimmick immediately follows competitor Taco Bell's highly-anticipated rollout this week of its first-ever breakfast menu, which it dubbed as the "largest menu expansion in Taco Bell's 50-year history." Taco Bell's move could take a big bite out of Mickey D's breakfast sales. Taco Bell said its breakfast ambition is aimed at making the quick-service chain standout in the crowded breakfast market by introducing items other than the usual breakfast sandwiches to customers. Taco Bell's breakfast menu includes the Waffle Taco -- a warm waffle wrapped around a sausage patty or bacon, with scrambled eggs and cheese and served with sweet syrup -- and the A.M. Crunchwrap. The Crunchwrap is a tortilla wrap filled with scrambled eggs, hash browns, melted cheese and bacon or sausage. Facing a sales slump, McDonald's recently said it was also considering expanding its breakfast hours. Breakfast at the restaurant typically ends in the late morning, aggravating some customers. "We know that breakfast on the weekend cut off at 10:30 doesn't go very well," said Jeff Stratton, the chain's U.S. head. He said the company is "just beginning" to reconsider how to best serve up the meal. 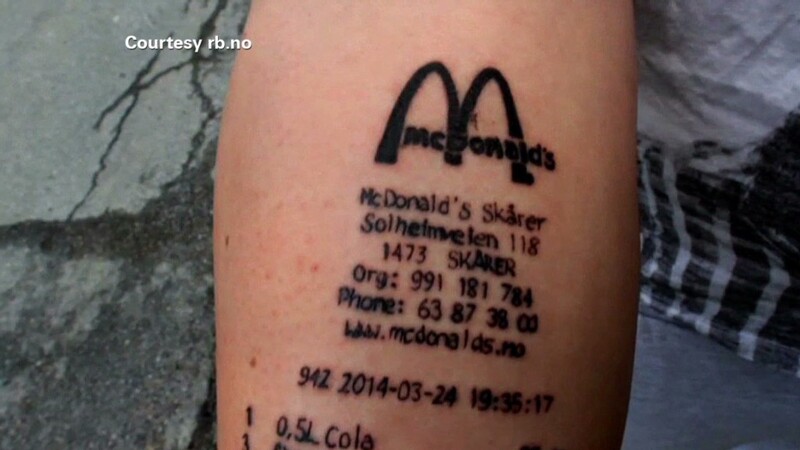 You got a tattoo of a McDonald's receipt? McDonald's said the free coffee is its way of encouraging new guests to try McCafe Coffee and "surprising them in unexpected ways all year long." The company said that starting in mid-April, it will surprise a Twitter (TWTR)follower every day for the year with McCafe coffee and prizes.